Aging is a natural part of life, and it eventually comes with day-to-day challenges. So why do we often feel unprepared to tackle the challenges and necessary choices in our later years? Many families work together to carefully select what’s best for their loved ones well in advance, but it’s not something most are eager to discuss or even think about. 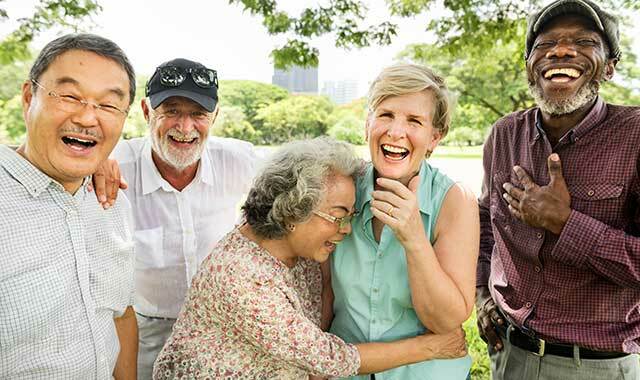 Reasons to move into a senior living community can range from a desire to eliminate the day-to-day challenges of keeping up a home, the social need to live near people the same age, or sometimes an inability to manage on one’s own. Many retirement communities cater specifically to independent, active retirees, some as young as 55. By taking advantage of the convenience and carefree lifestyle that senior living communities offer, retirees are better able to travel and do things they enjoy. Other retirement facilities offer assisted living for those who need help with certain day-to-day activities or skilled nursing care for those who require around-the-clock medical care. These communities give older adults the option to live in one location for the duration of their life, which can provide a great level of comfort to them and their families. In every corner of the region, our senior communities are creating safe and inviting homes where our seniors can age comfortably with access to quality care. These senior residences provide state-of-the-art amenities and individualized plans to cater to your specific needs. This guide will assist you and your loved ones in navigating the many options that are available. If someone in your family is looking for a senior community, our Northwest Quarterly Senior Living Guide is here to help. We believe that in the deepest part of our hearts, we have an innate desire to help others. Driven by this desire, people can be moved to do things that change lives. In 1904, two dynamic and determined women began a movement that resulted in Highview as we know it today. Highview in the Woodlands is nestled in a park-like, natural setting. Our residents can enjoy spring blossoms, summer roses, changing leaves and snow on the pines. They’re able to view all the seasons in their colorful display. Nature abounds at Highview. Highview’s interior is eclectic with antiques that enrich the environment and were given as gifts over the years to be enjoyed by all. The residents have a social life with each other and take excursions to various plays, parks, sporting events, the conservatory and great restaurants. Although individualized care is central to what is provided in both Assisted Living and the Alzheimer’s unit at Highview, it is the overall culture that energizes everyone. Our trained professional staff are there for each resident quietly fulfilling their needs. The staff strives to make any transition a smooth and pleasant experience as each resident enters new phases of life at Highview. We believe the secret to a happy life is where you are, who you’re with and what you’re doing. And while a sense of place goes far, it is the people and experiences that truly make our happy times. We strive to achieve this dynamic for each resident, making them feel at home, making them feel loved, and making sure they are loving what they’re doing. We believe our residents should continue to live with dignity and enjoy their special interests. We want them to make new friends, go on new adventures and explore new surroundings. They should thrive at Highview. With more than a century of experience providing for seniors, Highview in the Woodlands continues to refine our legacy of care. Our experienced leadership, dedicated staff and fully-licensed facility ensures our residents will enjoy an optimum quality of life. Our facility offers 36 one- or two-bedroom private apartments on the Assisted Living side and 26 private suites in our secure Alzheimer’s unit. We take great care in creating a traditional and safe environment that feels like home for all of our residents. Conveniently located in Rockton, Ill., Highview is just a short drive for family members traveling from Rockford, Belvidere or Beloit. We encourage you to browse our website in its entirety and to call us when you are ready to learn more. It would be our pleasure to answer your questions and give you a tour of our lovely facility. Be assured, you won’t be disappointed. We look forward to meeting you. More than 375 Fairhaven residents enjoy a comfortable lifestyle that provides many opportunities. The property includes more than 100 duplexes, nearly 100 independent living apartments, a supportive care center and a health center. Affiliated with the Evangelical Free Church denomination, Fairhaven offers a lifetime of care to people of all faiths age 62 and up. First Free of Rockford provides a worship service at Fairhaven on Sunday mornings in the Sjostrom Center Chapel. “When people talk about why they’ve chosen to live at Fairhaven, our spiritual focus is among the reasons why they’re here,” Hintzsche says. Fairhaven recently underwent an extensive common area renovation in the main independent building and in the health center building. The facility is also celebrating 50 years of service to residents and their families this year. A hallmark of Fairhaven’s dining experience is its quality comfort foods, good chefs and helpful wait staff. “The home-style cooking is what our residents were used to in their own homes, and so we want them to enjoy home-cooked meals here, too,” Hintzsche says. Inside the main building, where the dining room is located, residents enjoy an engaging atmosphere that includes a family room with computers, a video chat unit, a library, restaurant-style dining, a gift shop and a fitness center with classes guided by a fitness coordinator. Residents are invited to participate in special activities such as choirs, bell choirs and educational sessions, and to attend picnics, musical performances and other events. Pets are welcome to visit their loved ones and may live with duplex residents. Hintzsche counsels people to visit the retirement communities they are considering, enjoy a meal there, talk to residents and ask them about their experiences. Founded by a registered nurse and a health care administrator, Willowick Assisted Living is locally owned and places a premium on personal relationships with residents. Each community is designed to be “just the right size” – small enough that it’s easy to make new friends, but big enough to maintain a dedicated staff of caregivers focused on the well-being of each resident. When new residents move in, they complete a life history form, so staff members are able to develop a strategy that’s tailored to each person’s needs. The communities in the non-denominational assisted living facility feature beautiful and comfortable assisted living resident suites and common spaces. Both facilities feature independent and assisted living units. Willowick residents have access to plenty of amenities, including a salon service, a private dining room that can be reserved by residents and families, a general store for residents to buy household goods, a chapel that local clergy use to provide sermons and spiritual support and a wellness center where residents can exercise and utilize therapy services that help with their strength and conditioning. Staff members, including five nurses, are available 24/7. Housekeeping, maintenance and dietary specialists are also on hand. Meals and snacks are also served three times a day, with options for flexible mealtimes. These memory care assisted living communities offer a homelike environment for residents living with early to late stage dementia and Alzheimer’s disease. Cozy bedrooms, bright, spacious dining and community spaces give your loved one a place to feel safe and at ease. Residents can participate in daily activities, or they can relax independently under the watchful eye of staff members. Families are encouraged to personalize their loved one’s rooms with their own items, including family photos and other personal belongings, to create a familiar and comfortable living space. The rooms are very close to the living and dining rooms, where residents can socialize and enjoy home-cooked meals. Azura Memory Care offers compassionate care and transformational programming for those in need of memory care services. The homes are purposely decorated and designed to support those living with Alzheimer’s disease and other forms of dementia throughout their disease process. The Azura Memory Care team is provided with advanced dementia education through Azura’s exclusive MOSAIC Connections training program. They’re equipped with enhanced communication, approach and engagement techniques that look at each individual as an extraordinary person who deserves personalized moments of joy. This highly specialized program centers on improving the resident’s quality of life through meaningful, person-centered activities, which stimulate the senses to evoke memory, decrease pain and agitation, promote relaxation and offer comfort and serenity to those living with dementia. In addition to these engagement services, we also offer on-site physician, podiatry and other services that ensure every aspect of care is of the highest quality. You’re welcome to come and tour Azura Memory Care homes. Give us a call today at 608-295-2764 to schedule a personal tour. The decision to enter assisted living is rarely easy, so the folks at Crimson Pointe Senior Living, in Rockford, hope it’s the last time a family decides where a loved one will live. With studio and two-bedroom apartments, Crimson Pointe offers many ways to keep its residents in a comfortable environment that includes three delicious and nutritional meals per day and plenty of activities in the Lifestyle 360 wellness program. Onsite assistance is provided around-the-clock and can assist with simple daily reminders or more extensive support. Outside providers offer additional services, such as physical therapy, podiatry, audiology and in-home care. Crimson Pointe also helps its veterans, and surviving spouses of veterans, to age comfortably by connecting them with financial support through the Federal Aid-in-Attendance program. Depending on the resident’s situation, assistance can range from $1,176 to $2,169 per month, and can help to make the cost of assisted living more affordable. Staff members often meet with local community groups to share the importance of planning ahead for retirement living. They offer suggestions about how to narrow your options, how to plan with a relative and when it’s the right time to move. Heritage Woods is more than just a community. It’s a home where residents of all incomes can enjoy the privacy of their own apartments with the benefits of a caring staff around the clock, restaurant-style meals and plenty of social and volunteer opportunities that give meaning and fullness to their lives. The affordable, assisted lifestyle community is designed for seniors 65 and over who want to exercise their independence while enjoying safety and security. Licensed as supportive living, this community can serve seniors of all income levels including those on Medicaid. Both Heritage Woods locations are three-story buildings with studio and one-bedroom apartments. Each apartment includes a kitchenette, spacious bathroom with a shower, emergency response system and independent climate control. You’ll also find plenty of common spaces to enjoy, including an activity room, country store, exercise room, library and lounges with fireplaces, patios and a gazebo. Amenities include three meals a day, housekeeping and 24-hour staffing by certified nursing assistants working under the direction and guidance of a registered nurse. This entry was posted on Friday, August 17th, 2018 at 11:59 am	and is filed under Home & Garden. You can follow any responses to this entry through the RSS 2.0 feed. Both comments and pings are currently closed.